The Bermuda Underwater Exploration Institute [BUEI] will screen a film titled “Imagine a World Without Fish: The End of the Line” during an installment of the BUEI Talks series on May 3. The screening of the film – based on a book by Charles Clover, who will be on hand for a Q&A session – will be held at 6.30pm. The event poster says, “Charles Clover is Executive Director of the Blue Marine Foundation, an award-winning marine charity. A lifelong author and journalist, he was Environment Editor of the Daily Telegraph for 20 years and still writes for the Sunday Times in London. 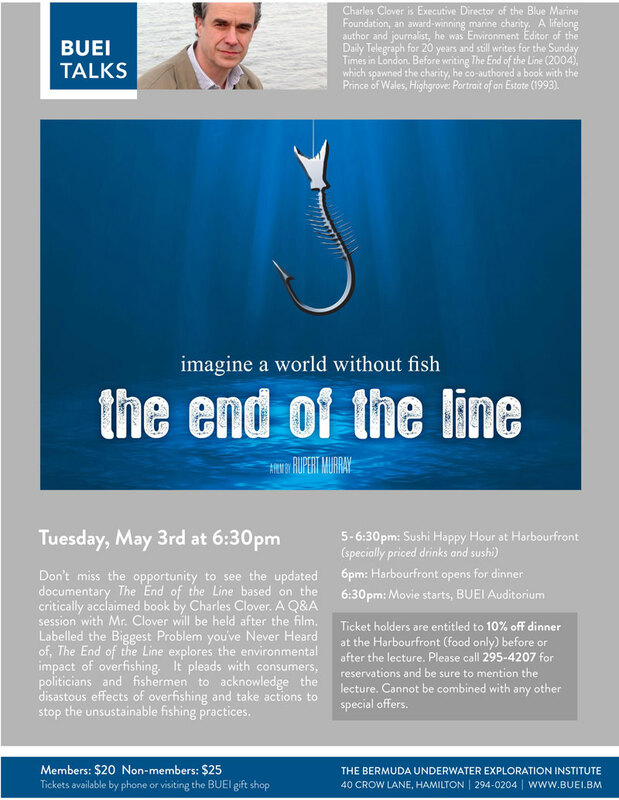 “Don’t miss the opportunity to see the updated documentary The End of the Line based on the critically acclaimed book by Charles Clover. A Q&A session with Mr. Clover will be held after the film. Labelled the Biggest Problem you’ve Never Heard of The End of the Line explores the environmental impact of overfishing. Preceding the 6.30pm screening, a Sushi Happy Hour will be held at Harbourfront from 5.00pm to 6.30pm, with dinner opening at 6.00pm. Tickets cost $20 for members and $25 for non-members, and are available by calling 294-0204 or visiting BUEI’s Oceans Gift Shop. A Shushi Happy Hour before a lecture on over-fishing and unsustainable fishing?